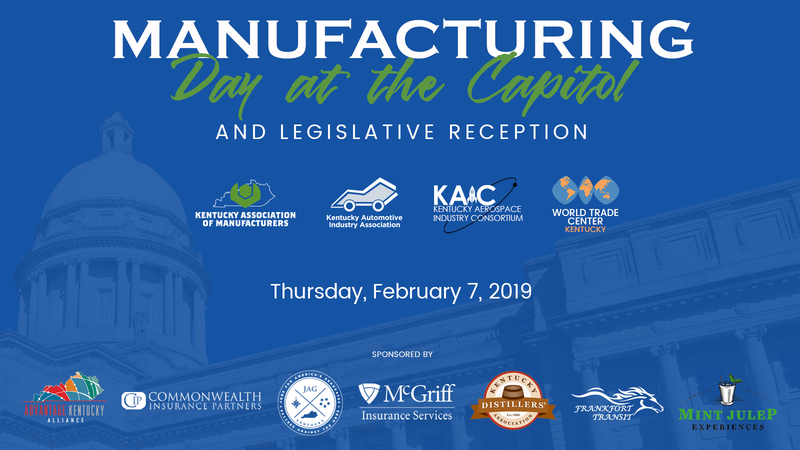 Join KAM’s Government Affairs Team and manufacturing representatives from across Kentucky for a special day at the Capitol. We will speak with leadership from both the House and Senate in the morning, hear from top officials over lunch and attend General Assembly in the afternoon. The day will wrap up at the Lancaster with a reception with legislators and colleagues before Governor Bevin delivers his State of the Commonwealth address. Tentative agenda is subject to change. Co-hosted by the Kentucky Association of Manufacturers, Kentucky Automobile Industry Association, Kentucky Aerospace Industry Consortium, and World Trade Center Kentucky.